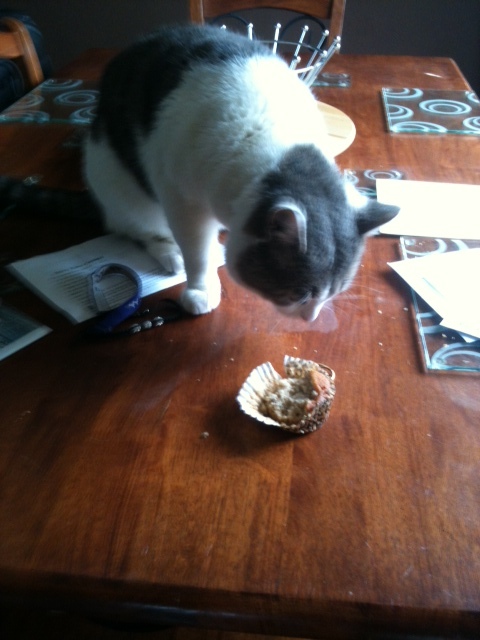 Do I own the only cat in the world who likes cupcakes?? Luvvies – so wonderful to talk to you once more. This benefits not only me, but my beloved (we wed two weeks ago) who is enjoying daily compliments and increased housework effort on my part*, and the cat, whose strenuous efforts to steal food from my plate are now greeted with “Aw, are you hungry Freddie?”, rather than shrieks followed by a quick squirt of the water spray. I say freelance writer, you’ll note, but not paid freelance writer so all of this happiness is all very well, but it’s no good without the moolah, hmm? Blogging has been a learning curve. In my pre-married naivety, I imagined I could write a few wee, witty words** about weddings, people would flock to my site in their hundreds of thousands and et voila, a new writing career would emerge. At which point, I would play tough negotiater and demand that Green & Black involve me in their product development, namely tasting, from now on. Oh reader, it did not happen… I have been investigating many of the ways one can use to get one’s blog noticed, read and followed. Australian business coach Casey Gollan has plenty of useful advice on unusual ways you can use to get your posts noticed. Tweeting old posts for example, promoting your post on LinkedIn and to your relevant LinkedIn groups and mentioning contacts on Twitter. He also suggests interviewing someone very influential in your field to creating a ‘how to’ video for YouTube. Casey also recommends file-sharing sites such as SlideShare and Scribd, as these are sites people can go to find answers to questions, or if you have written something that answers a common question – say, how to put sugar paste on a cake – why not share it on Yahoo Answers, making sure that you include your blog URL? *Ladies and gentlemen – ironing was carried out. Red wine stains were banished from the floor. Rubber gloves and a face mask were donned so that maximum strength industrial cleaner could be applied to the oven and three years’ worth of grime removed. **Hopefully they were witty words chums. ***Reader, this happened… I cut out the offending piece of icing.